A Christmas Carol will star one of Britain’s best-loved entertainers: comedian, actor, writer and producer Griff Rhys Jones will play Charles Dickens’ great miser Ebenezer Scrooge. 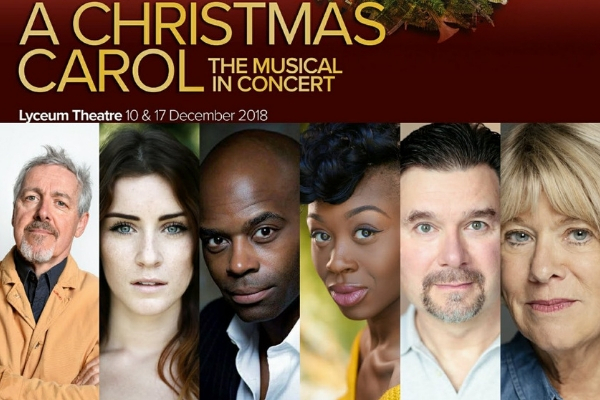 Joining him are Lucie Jones (Les Misérables, Legally Blonde, Eurovision 2017) as Emily/The Ghost of Christmas Future, Miriam-Teak Lee (Hamilton, On The Town) as The Ghost of Christmas Past, Cedric Neal (Chess, Motown) as The Ghost of Christmas Present, Rosemary Ashe (The Witches of Eastwick, The Phantom of the Opera) as Mrs Fezziwig, and Nicolas Colicos (The Producers, The Bodyguard) as Mr Fezziwig. Further casting is soon to be announced. Due to exceptional demand, a matinee performance has been also added at 4pm on Monday 17 December. Shaun Kerrison returns to direct this hit production. LMTO’s concert version of A Christmas Carol follows their triumphant performance of Lerner and Loewe’s Camelot at the London Palladium and Martin Smith’s King at The Hackney Empire earlier this year, as well as Mack and Mabel at the Hackney Empire, Bernstein’s Candide In Concert at Cadogan Hall in 2017 and a sell-out five-star 2016 season. LMTO’s production of Howard Goodall’s Girlfriends will be performed on 2 November and 3 November and stars Lucie Jones, Lauren Samuels, Bronté Barbé, Natasha Barnes, Vikki Stone and Rob Houchen.